They’re young, they’re eager, and they’re very cool — who better to support in this crazy world??? 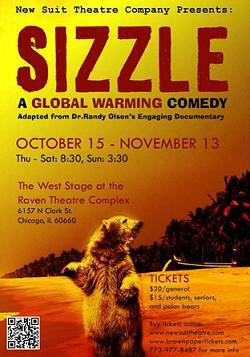 COMING TO CHICAGO ON OCTOBER 15: SIZZLE THE PLAY! It’s been over a year in the making, but the time is now rapidly approaching for the opening of the stage version of my movie, “Sizzle: A Global Warming Comedy.” The New Suit Theater Company in Chicago is putting on the production. They could use YOUR help in their Kickstarter fundraising drive. I just gave them a substantial donation. If you’re thinking, “How can I do something meaningful,” in the struggle to communicate global warming to the general public, this is a perfect opportunity. This is a VERY creative and “outside the system” effort they are putting together. It’s a group of college aged folks who want to engage in an important issue in a creative way. So make a statement for originality by going to their KICKSTARTER PAGE BY CLICKING HERE and give ’em a few bucks. They’re on to something very cool.